Democratic senator Elizabeth Warren (Mass.) is backing legislation that would heavily benefit a foreign gambling conglomerate and a string of special interests, despite pledging to end public corruption in Washington. 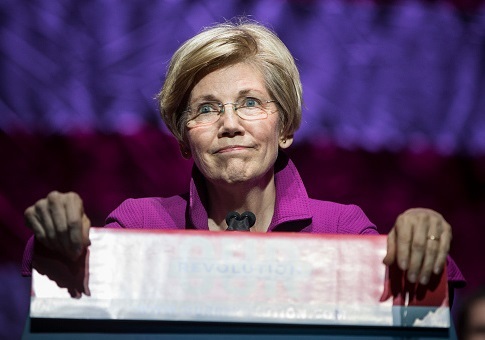 Warren, a potential 2020 presidential contender, introduced the Mashpee Wampanoag Tribe Reservation Reaffirmation Act in March of this year along with the rest of the Massachusetts congressional delegation. The act aims to circumvent legal obstacles currently thwarting the Mashpee Wampanoag's attempts to establish a casino. The senator, who has been dogged by controversy surrounding her claims of Native American heritage, has embraced Mashpee Wampanoag's cause as her own. The embrace has been especially surprising considering Warren, until recently, was hostile to legalized gambling. As a candidate for the Senate in 2011, Warren strongly opposed successful efforts to expand casino-style gambling in Massachusetts. In 2014, she backed an unsuccessful ballot initiative to repeal the expansion on economic grounds. "It's a tough call here. People need jobs, but gambling can be a real problem economically for a lot of people," Warren told the Boston Herald. "I didn't support gambling the first time around and I don't expect to support it [now]." Earlier this year, however, Warren's tone shifted. Before the National Congress of American Indians, the senator promised the tribal leaders in attendance she would fight against "our country's mistreatment of your communities." Shortly after making that promise, Warren sponsored the Mashpee Wampanoag Tribe Reservation Reaffirmation Act. The senator's transformation was on display last month when Warren and her Democratic cosponsor from Massachusetts, Sen. Ed Markey, offered a response to the Interior Department's September ruling against the Mashpee Wampanoag. "America has a painful history of systematically ripping apart tribal lands and breaking its word," the senators said in a statement. "We cannot repeat that history. Today's action by the Trump Administration is yet another deal the federal government is reneging on with Native Americans, and it underscores why Congress must pass our legislation." The legislation, if enacted, would force the Department of the Interior to place over 320 acres of land owned by the Mashpee Wampanoag in Southeastern Massachusetts into a federal trust, thereby designating the land a tax-exempt Native American reservation. Since reservations are sovereign in nature, state and local governments have limited ability to regulate what occurs within their borders. Tribes across the country have used this provision to skirt prohibitions against gambling and establish their own noncommercial casino-style resorts, which appears to be the end goal for Mashpee Wampanoag. As previously reported by the Free Beacon, the tribe has partnered with the Genting Group, a Malaysian gambling giant, to open a casino on 150 acres of land in Taunton, Mass. The partnership appears to be both complex and lucrative for each side involved. The majority of the risk is held by Genting, which has already sunk $249.5 million into what is estimated to be a $1 billion dollar project. Genting has agreed to forgo any return on its investment until the casino is up and working. Furthermore, the deal stipulates that if the casino is not built, the tribe would not be responsible for repaying Genting's investment. For its part, Genting has secured the rights to manage the day-to-day operations of the casino upon completion. This guarantee has raised concerns that the institution will be a commercial casino in everything but name. Genting has hired Gavel Resources, a Washington, D.C., government relations firm, through its law firm, Dentons, to lobby in favor of the casino, as denoted by disclosure forms. Gavel's lobbying team, headed by former House Natural Resources Committee chairman Richard Pombo (R.), was actively pursuing the matter in front of Congress as Warren introduced her legislation. The strategy being implemented by Gavel and Dentons at the moment seems to emphasize building bipartisan support for both the House and Senate versions of the bill. To that end, the House bill has found more success by garnering 19 cosponsors from both Republican and Democratic ranks. In July, the House Natural Resources Subcommittee on Indian, Insular, and Alaska Native Affairs held a hearing on the measure and further action is expected in the committee later this fall. Since the start of this election cycle, Dentons's PAC has donated approximately $40,000 to individuals, Democrats and Republicans alike, supporting the legislation. Dentons PAC gave Sen. Markey's campaign $2,500 on March 28, 2018—six days after the Senate bill was introduced. The donation came even though Markey is not slated to seek reelection until 2020. A further $2,000 was contributed to Markey's campaign account in June, bringing the overall donations from Dentons to $4,500 for this cycle. This is more than the total amount the senator received from Dentons between 2014 and 2016, according to the Center for Responsive Politics. Neither Genting, Gavel, nor Dentons returned requests for comment. Similarly, requests for comment were not returned by Sen. Markey's office. Warren has persisted in championing the legislation, despite declaring in August that she was undertaking "the most ambitious anticorruption legislation since Watergate." "Our national crisis of faith in government boils down to this simple fact: People don't trust their government to do the right thing because they think government works for the rich, the powerful, and the well-connected and not for the American people," Warren said. "And here's the kicker: They're right." The senator's anticorruption plan consists of banning lobbyists from donating to political candidates, boosting transparency laws, and cracking down on financial conflicts of interests, among other measures. It is unclear if the senator is aware of the special interests that have lined up behind her bill. Financial campaign records indicate that Warren has not accepted any donations from Dentons since introducing the legislation. Requests for comment from Warren's Senate office and campaign were not returned. Geoff Diehl, the Republican vying to unseat Warren as she seeks reelection, told the Free Beacon he was urging the senator to explain her reversal on legalized gambling and if pressure by special interests was a factor. "Elizabeth Warren should be transparent as to why she now supports gambling in Massachusetts after she vehemently opposed it in the past," Diehl said. "Warren should be transparent and release her records on any lines of communication between the lobbying firm Gavel Resources and Genting, the foreign gambling giant pushing this bill." Questions have also arisen from neighboring tribes as to whether the Mashpee Wampanoag have a legitimate ancestral claim to the property in Taunton as required for it to be designated a reservation. The tribe appears to have specifically purchased the land in 2015 for $34 million with the intention of building a casino at the location. Critics have pointed out that no land deeds of sale existed between the Mashpee Wampanoag and European settlers to back up their claims to the land. This entry was posted in Issues and tagged 2018 Election, Democratic Party, Elizabeth Warren, Ethics, Gambling, Massachusetts, Native American. Bookmark the permalink.